I. What is the Resolution? The resolution, also known as the denouement, is the conclusion of the story’s plot. It’s where any unanswered questions are answered, or “loose ends are tied.” Interestingly the phrase denouement comes from the French word dénouement meaning “to untie.” A story with a complete ending is said to have a strong resolution. Exposition: At the beginning of the story, characters, setting, and the main conflict are typically introduced. Rising Action: The main character is in crisis and events leading up to facing the conflict begin to unfold. The story becomes complicated. Climax: At the peak of the story, the main event occurs in which the main character faces the conflict. The most action, drama, change, and excitement occurs here. Falling Action: The story begins to slow down and work towards its end, tying up loose ends of the plot. Resolution: Also known as the denouement, the resolution is when conflicts are resolved and the story concludes. The resolution allows a story to end without trailing off or leaving the reader confused or unsatisfied. For examples of resolution, consider the short stories below. Kim was angry at her brother Brandon for stealing her peanut butter and jelly sandwiches from the fridge before school. To teach him a lesson, she loaded hers with hot sauce. Sure enough, at lunch, Brandon’s eyes began watering and he asked her, “What did you do to this sandwich?” “Teach you a lesson!” she replied. Brandon never stole another sandwich again. In this example, the exposition explains that Kim is angry at her brother for stealing her lunches. The rising action occurs when she plans to teach him a lesson. At the climax of the story, he eats the sandwich and discovers what she’s done. The falling action is when she reveals what she’s done. Finally, the resolution occurs when we learn that Brandon will never again steal another sandwich. This ties up the story and notifies the reader of exactly how it ends. My dog Brady was acting strange and running to the shed and back to the house. I asked him what was wrong and followed him to investigate. Inside was a black and white cat with four kittens! I got the cat and her kittens a blanket and took them inside to keep them warm. I had five new pets! In this story, the exposition introduces a mystery: why is the dog acting so strange? The rising action is the decision to find out. The climax occurs when I discover the kittens, and the falling action occurs when I begin taking care of them. Finally, the resolution concludes that I have found five new pets and will adopt the cat and her kittens. Bobby was upset about his poor grades. He asked his mom for a tutor. After working with a tutor for about a month, he took a major math test. He aced the test! Thanks to hard work and studying, Bobby was becoming a star student. In this example, the conflict is introduced in the exposition: Bobby has poor grades. The rising action is asking for a tutor and studying. During the climax, Bobby faces his problem and aces a test. The resolution is that Bobby has begun to become a great student thanks to positive decisions. As these examples show, the resolution is often simply the ending. It is when the story closes and the reader is aware that the plot has come to its natural conclusion. If a story ends weakly or feels as if it hasn’t ended with the last sentence and the last word, the reader is left feeling discontent, confused, or even betrayed by the writer. Although not all denouements or resolutions are happy or satisfying, they should allow the reader to feel as if the story has come to a proper conclusion. This is why the resolution is so important: a story must have a clear beginning and conflict, rising action, exciting climax, falling action, and lastly, a clear ending. The resolution is a necessary component of plot in both poetry and prose. Below are a few examples of resolution in famous compositions. In F. Scott Fitzgerald’s famous ending to The Great Gatsby, the narrator muses on the protagonist Gatsby and his development over the course of the story as well as larger ideas like humankind’s smallness in the face of passing time. story, but our present story is ended. Fyodor Dostoyevsky’s ending to Crime and Punishment is perhaps one of the most classic and straightforward examples of what a resolution should do: notify the reader that the story has ended. In his brief poem “Those Winter Sundays,” Robert Hayden examines his father’s silent kindness to him as a child, heating the house, and concludes as an adult that he did not understand just how loving his father had been. His resolution ties together the poem as a reflection on his father’s love. That’s all folks! Just as stories and poems have clear endings, so do TV shows, advertisements, movies, songs, and other forms of storytelling. Here are a few examples of resolution in pop culture. 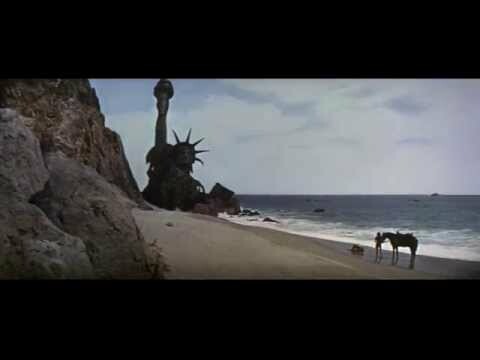 The film Planet of the Apes has a very dramatic and clear resolution. Throughout the movie, astronauts have believed they have landed on a foreign planet in the future. As the ending scene reveals, though, they have truly landed on the earth of the distant future, as the Statue of Liberty has been destroyed and is one of the few vestiges of the past. This is an example of a surprise ending. This short film has a more typical happy ending or resolution: the brother apologizes for his bad behavior and the sister appears to accept it. The story ends beautifully, cleanly, and happily. Two football teams, Bearden and Farragut, are known to be great rivals. After training all season long, they finally face off in an intense game. The game goes into double overtime when, at last, Farragut wins with a nearly miraculous touchdown. Happy to have won, Farragut marches off the field in a school-wide celebration. In this story, the climax and resolution are two distinct occurrences, though the resolution occurs immediately after the climax. At last, Farragut wins with a nearly miraculous touchdown. The entire story has been leading to the climax: either Farragut or Bearden wins the game. Here, Farragut succeeds, ending the story’s conflict. Happy to have won, Farragut marches off the field in a school-wide celebration. In this example, the resolution is simply the happy team celebrating its glorious victory. The team happily celebrated their victory after a challenging face-off with their rival. Here, the resolution marks the end of a story. In conclusion, football is a sport which encourages the development of both teamwork and school spirit. This formal conclusion is an example of the ending for a paper written about how football allows schools to develop unifying traits like teamwork and school spirit. The resolution, or denouement, is a necessary component of any good story, from songs to poems to prose to movies. Just as stories need interesting beginnings and exciting events throughout, they need strong endings which tie together the plot and leave the reader feeling finished.